So hey, no big, my kid loves spinach. I’m trying to play this cool but in reality I am so freaking excited. After two children who refuse to touch the stuff, I have one babe who shares his mamas love of the OG superfood. 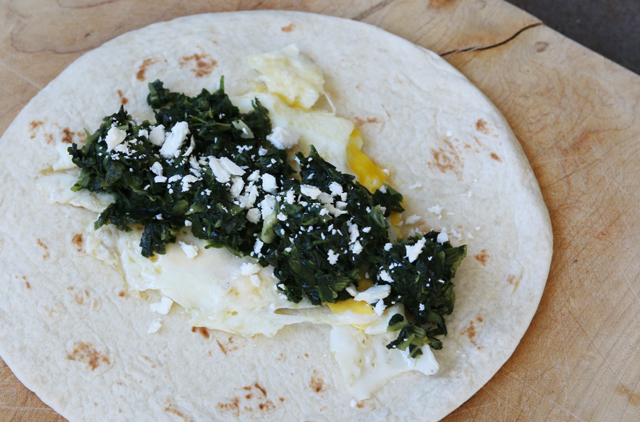 It all started when, in a pinch, I purchased myself a Spinach Feta Wrap from Starbucks. It was delicious. Gordon asked for a bite and it blew his mind. I watched him eat the rest. My stomach growled. He demanded a second. We went back. I realized that this was going to get expensive. We made some at home. Now we have a new favorite healthy and delicious breakfast option. Make these. Eat some. Freeze the rest. Grow big awesome Popeye muscles if you are into that. Steam spinach according to package directions and strain out liquid. In a saute pan, heat olive oil on med heat and saute garlic for 30 seconds to 1 minute. Be careful not to burn. Carefully add spinach, vinegar, and seasoning and stir until liquid is evaporated from spinach. In a frying pan, cook eggs as desired, either fried or scrambled. On one tortilla (use whole wheat if you have them!) 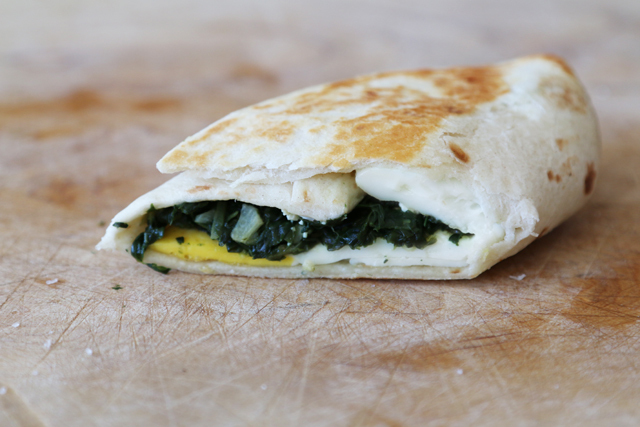 layer an egg, spinach mixture and feta cheese. Note: I recently bought some awful fat-free feta by mistake (not good) but it was surprisingly acceptable in this dish. So try that if you are into trying diet cheese. 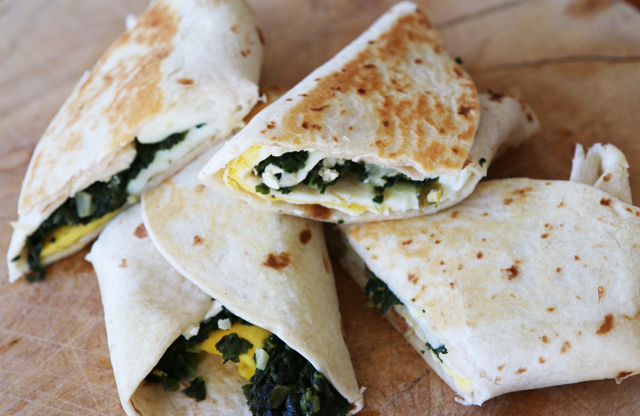 Wrap like a burrito and toast in a lightly oiled (or buttered, yum) pan. Eat it up. Grow big and strong like Gordon! If you want to freeze some. Let them cool, wrap in plastic wrap and freeze. When you are ready to eat them, heat them up in the microwave for 2-4 minutes. I want one of these in my face right now. How many wraps do you usually make from this recipe? Sorry I missed this Cynthia! 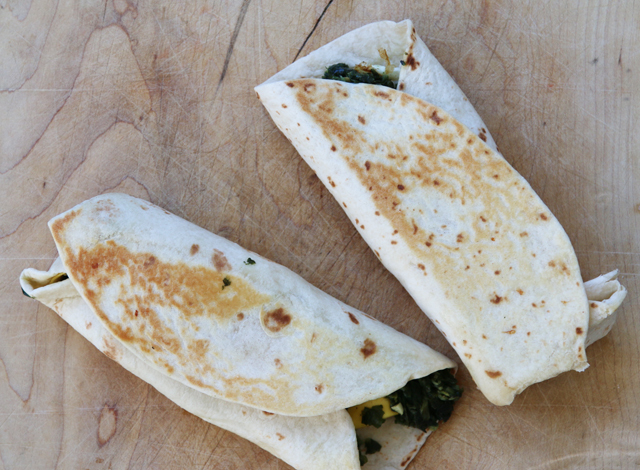 Depending on how much spinach you add, you will get 4-6 wraps from this recipe. Enjoy!